If Saturday night's Mod race at New Smyrna Speedway was a heavyweight title bout, Chuck Hossfeld would have won with a knockout. While the other fighters were busy jabbing', "Hoss" had his arms raised in victory lane. The win was extra sweet for Chuckie, who had an interesting opening night at Smyrna. He spent much of that night sideways and even bounced off the wall racing for the lead. His chance for a win that night disappeared when his #22 ran out of gas with a few laps to go. Team and was named the driver of Don Barker's #50, the same ride that Todd Szegedy captured the Mod Tour title with two years ago. The Tour regular came down to Speedweeks with his DeLange owned ROC Mod. Winning at Speedweeks in the beautiful black #22 machine was something that Hossfeld is very proud of. “I love this car, said Hossfeld. “I own a garage and live above it. This car is like my pride and joy. I spend a lot of time with this car. So to me it is pretty gratifying. We built it and for me to come down here and be competitive and win with it is very gratifying. And with the Mod Squad now off for a day, Chuckie can relish in his win a little longer. But Saturday night, there were less cautions and Hossfeld had plenty of gas en route to a dominating win. “Last night wasn't one of my best races,” admitted Hossfeld after the win. “I came out here tonight and wanted to run a perfect race and do everything right. I am very happy with the race I ran tonight. Last night we were fast but too loose. Behind Hossfeld on Saturday night, there was a game of bumper tag being played. Early in the race Kevin Goodale got into the back of Eric Beers' #9 and got by. Beers got sideways and did a tremendous job not looping his racer. After the tag, Goodale knew that he was “it”. It took Beers a while to make a move, but he gave Goodale a return tap with a few laps to go sending Kevin from second to fourth for the finish. There were no hard feelings between the two drivers. It was just an good example of some good hard Short Track racing. Beers finished second and thought that with a caution to tighten things up he may have had something for Hossfeld. 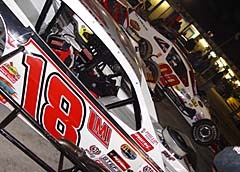 As for Goodale, his performance over the first two nights may be the biggest surprise of Speedweeks so far. 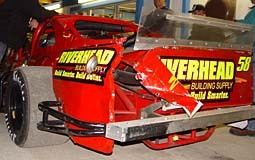 The Long Island driver has certainly improved from last years Speedweeks. Donny Lia had another disappointing night at New Smyrna Speedway. The LMI #18 was fast but real loose and ended up spinning twice. Early in the race, Lia hit the curb in turn one and went spinning. During his slide, Teddy Christopher made contact with Lia, finishing the spin. Donny was disappointed with his performance after the race and put no blame on Christopher for the spin. Charlie Pasteryak and his crew worked their butts off to get his #5 back together after it was badly damaged slamming the wall on opening night. The hard work paid off with a nice 5th place finish. Jonathan McKenney stayed out of trouble to finish 6th in the Mike Boehler #34. Curtis Truex Jr. started on the pole after the re-draw but was quickly shuffled back at the start. Truex finished 7th. 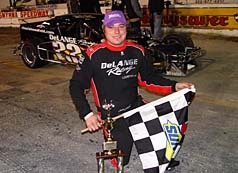 2004 NASCAR Mod Tour Rookie of the Year Zach Sylvester set the quickest time in qualifying but dropped out during the race with mechanical woes and finished 20th. Jeff Malave ran his first night at Speedweeks. The Northeast Short Track veteran said he wanted to just stay out of trouble and keep the car clean and go after it during next weeks races. Malave finished 10th. Long Island driver Glen Tyler, rebounded from a rough first night, to bring his immaculate number 28x to steady 13th place finish. Still no sign on JR Bertuccio although it was believed he would be racing starting the second night. JR's father was in the pits and told Speed51.com that they had been in North Carolina where they recently bought some property. JR was not at the track and his father said they had no plans of running any of the races even though there trailer was in the infield. Interesting indeed. Dale Holdridge beat Dave Michel to the checkers to win the SK Mod race during night number two. Ted Christopher jumped over the wall and ran to victory lane to congratulate the Connecticut driver. Zach Sylvester's #15 was fast during time trials.